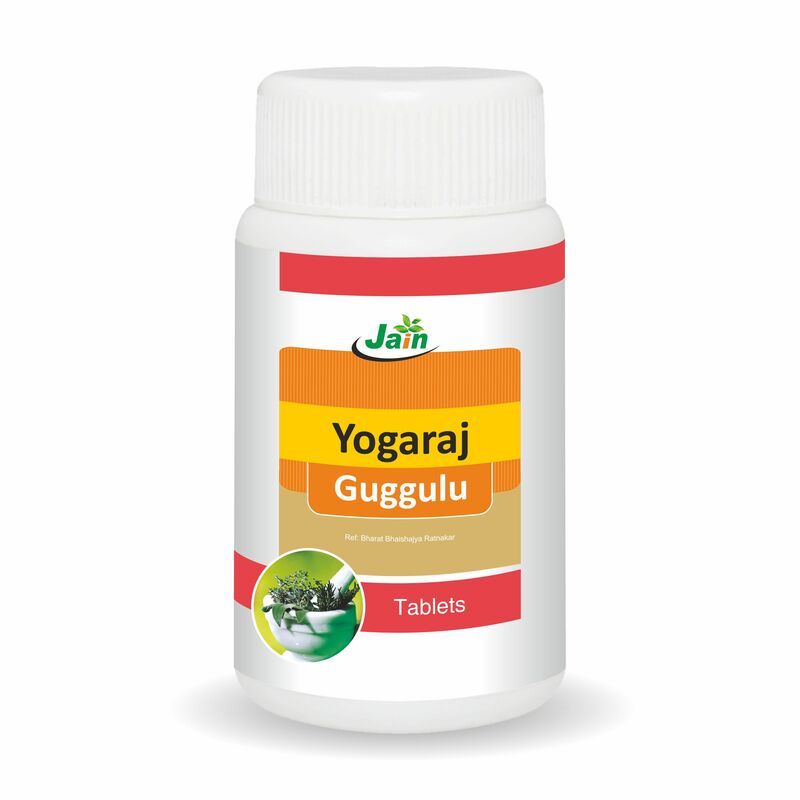 Yograj Guggulu is a traditional herb which is indicated for natural cures for arthritis. All the remedies for joint pain available in the market may produce adverse effects but this herb is known for its wonderful effect in the natural cure for arthritis. Guggulu is a well known traditional herb that is used to strengthen the joints and give relief from stiffness. Each Tab contains 2.083 mg. of choorna of Hingu, oleo-gum-resin, Shunthi, Pippali fruit, Pippalimoola, Chavya stem, Chitraka root, Jeeraka fruit, Ajamoda fruit, Sarshapa seed, Jeeraka fruit,Renuka Beej, Patha root, Indrayava seed, Vidanga fruit, Katuka, Gajapippali fruit, Ativisha tuberous root, Bharangi root, Vacha rhizome, Murva root each and 27.778 mg of Haritaki fruit, Bibhitaka fruit, Amalaki fruit pericarp each & Shodhit Guggulu (Commiphora wighii) exudate (Dashamoola shodhit) 125.000 mg.
2 -3 tablets should be consumed twice a day.These must be consumed either with lukewarm cow’s milk or lukewarm water or even with honey. Yograj brings about nourishment of the various dhatus in the body. Is one of the most powerful cholesterol-lowering agents known, since it brings about the lowering of triglycerides. Yograj is also known as antispasmodic. Yograj produces carminative, laxative and detoxifying properties. Yograj is beneficial in various types of genito-urinary disorders both in males and females. This is recommended for a variety of conditions including arthritis, diarrhea, dysentery, pulmonary disease, and ringworm. Yograj benefits in various types of respiratory disorders. Yograj is extremely beneficial in flatulence. Benefits in various types of mental disorders. If a person is suffering from worm infestations and passes worms in stool this is one of the best known remedy. E.g. in ringworm. Yograj is also known for its benefits in diarrhea and dysentery. Yograj is very useful in paraplegia, hemiplegia, gout and sciatica. Yograj is very effective in spondilitis & lumbago. It has anti-inflammatory and lipid-lowering properties. It also helps remove fat, excess fluids and Ama from the body, and penetrates deep into the tissues.